What do you understand by the term Earned Value Management? The status of the project is being identified and the progress is tracked as well as future performance is being forecasted by using a technique known as Earned Value Management. 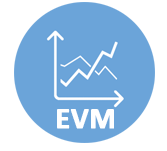 This tutorial explain in detail about the basic concept of Earned Value Management (EVM) and also how EVM is used for managing the project in a better and improved manner. Who are the audience for learning the concept of Earned Value Management? This tutorial is mainly targeted for the project managers and the professional who are likely to become the project managers. The tutorial provides useful insights for the project managers to improve the management of the project. What are the prerequisites required for learning the concept of Earned Value Management? Good knowledge and understanding of the concept of project tracking is essential for learning the concept of EVM. Knowledge and understating of the overall project management helps in better understating the concept.